My rescue group pulled a gorgeous and very large GSD off death row. I ended up with him due to no other foster homes available. This dog reminded me too much of the police dogs I used to groom. I have a 3 yr old and a 7 yr old. Being a bit nervous I had a vet scan his microchip. 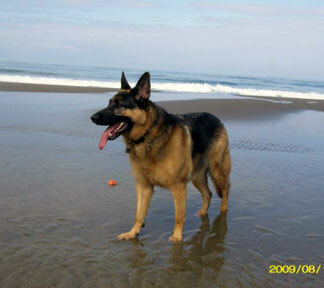 I contacted the previous owners for info on why they dropped off their almost 5 yr old champion looking GSD to die. They said he gets out of the fenced and plays in traffic. He is a SAR dog and went through all the training. He doesn't have aggression issues according to him, but is very protective of his bone or toy with my other 3 dogs and will growl and snarle. This dog wants to do nothing more than work. He doesn't sleep. Any info would help with his commands so I can work with him. Can he still be a SAR dog? Who could I contact about him? Congratulations on your rescue and foster of that wonderful boy! Concerning the SAR I would definitely contact: http://sardog.org to start and see if they can offer you any more info on what to do with him and maybe even to find a full time home with a SAR trainer for him. I would also suggest going to Google or your favorite search engine on the internet and checking on "SAR dogs" or "SAR dog training" and maybe even "SAR dog training in Georgia". Good luck with your new foster dog and I hope you all find the best situation possible to help you and the dog asap! I forgot to add that my dog that I mentioned in the other post, was NOT used to having children, especially young ones like that, 1 1/2 year olds around much at all, that was the first for her when she was with us, so we really didn't know what to expect when she spun around to play rough and saw it was my nephew, and yes she did let him play with her, and she did GREAT with him. We WERE all holding our breath as everything happened so fast, it WAS scary. She would go after the pup if the pup tried to play with her toys, other than that, they got along super. As a result though the pup never did play much with toys in the house, even when the other dog had died. I had a GSD, got her when she was 25 months old from my brothers neighbor, he bought her for his wife, they got divorced, he felt bad about the dog bein kenneled so much while he was working, so I ended up with her. Anyway when we found out she had 6 months left to live, we started looking for GSD puppies, anyway, when we got a puppy, she was 8 1/2 weeks old when we got her, the other one was about 8 years old at that time, she was great with the pup, even tried to nurse the pup, but when it came time for her toys, she was something else! She had a dominance/aggressive personality, which I couldn't give her an inch, or she'd rule, she didn't like it but did know who was in charge. She actually would get rough with her playing with me, I'd stop right away, or she'd get too aggressive. When my nephew was over, the dog and I were playing kinda rough, well he was 1 1/2 years old, he picked up her toy to throw, she spun around so fast, we all thought my nephew was going to get hurt, instead she just looked at him like, ok I can't play rough with you, she was great with him! I would say that IF it's really a SAR, the dog may have certain tendencies toward being possive/aggressive with toys, but that may POSSIBLY be where it ends, maybe not, hard to say, without knowing more. I hope this helps.